Eduard continues their Brassin range of weapon releases with a pair of AGM-65 Maverick air-to-surface missiles with LAU-117 single-rail launchers in 1/48 scale. The AGM-65 is cleared for use with more than 25 different types of aircraft but is commonly seen in use with the A-10, F-16, F/A-18 and AV-8B. The missile can also be seen on the F-4E, JAS39 Gripen, RAF Harriers, and even the P-3 Orion. Many versions of the Maverick have been used since 1972, and not all by the same operator i.e. US Air Force, US Navy, USMC or non-US users. So it’s important to check your references. 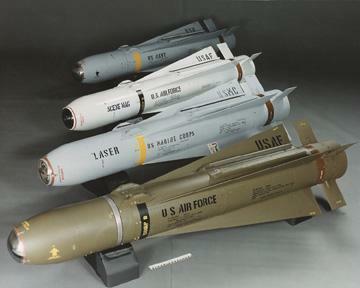 From front: AGM-65D, AGM-65E, AGM-65B and AGM-65F (Source: Raytheon). 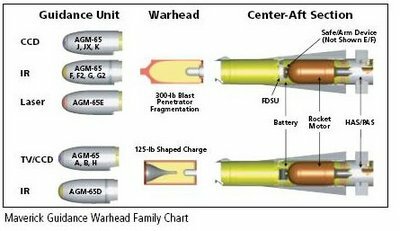 Each version of AGM-65 is based on the type of guidance unit (TV, CCD, IIR or Laser) and the warhead (Blast Fragmentation or Shaped Charge) (Source: Raytheon). Original version of the Maverick first introduced in 1972. It used an electro-optical television guidance system, for daylight use only, and a shaped charge warhead. Upgraded version of the AGM-65A introduced in 1975. It featured an improved television guidance system with a screen magnification capacity that enabled the pilot to identify and lock onto smaller targets at greater range. Introduced in 1983, the AGM-65D features an IR guidance system enabling night, darkness or adverse weather engagements. The AGM-65D retained the shaped charge warhead of the TV guided A/B models. The AGM-65E was developed to meet the USMC requirements. It features a laser seeker and a penetration/blast fragmentation warhead in lieu of previous models shaped charge warhead. It achieved IOC in 1985 and was used mainly by USMC aviation. Designed for US Navy, it features the IIR seeker of the AGM-65D in combination with the penetration/blast fragmentation warhead and propulsion sections of the AGM-65E. 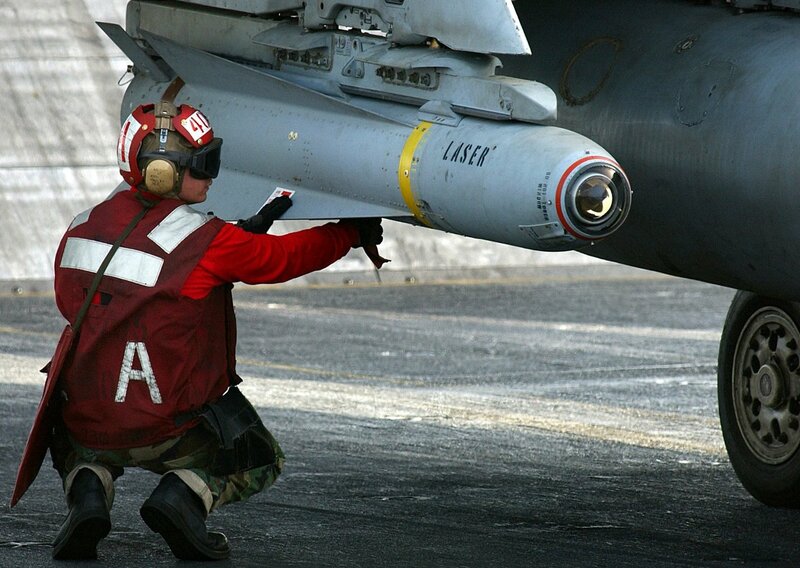 The AGM-65F is optimised for use against surface ships. The AGM-65G is an improved IIR Maverick for the USAF. It utilises an upgraded IIR guidance system of the AGM-65D, but the shaped charge warhead is replaced by the penetration/blast fragmentation warhead of the AGM-65E for use against larger targets such as structures. The AGM-65H is a re-built AGM-65B replacing the dated TV guidance system with a new charge-coupled device (CCD) sensor. It retains the shaped charge warhead for use against armoured targets. The CCD-TV sensor provides a clearer picture with longer standoff range and is better suited for the desert environment. 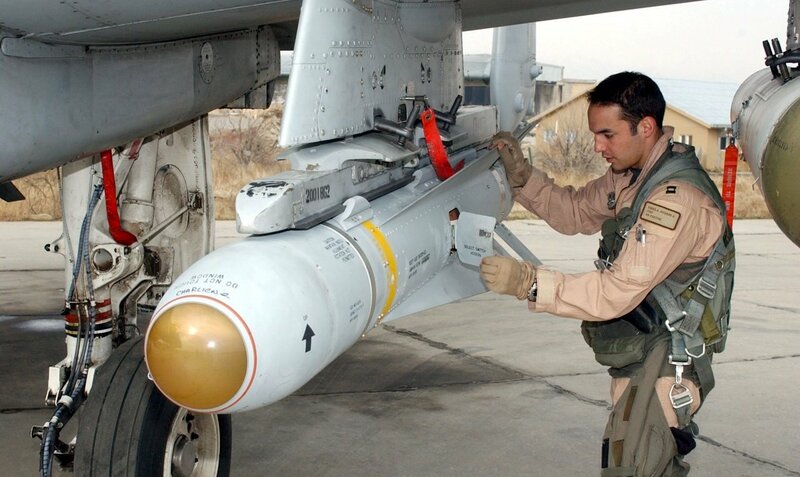 The AGM-65H missile was employed successfully for the first time in 2003 during Operation Iraqi Freedom. The AGM-65K is a re-built AGM-65G replacing the IIR guidance system with a CCD sensor, same as used on the H models. The AGM-65K retains the penetration/blast fragmentation warhead. 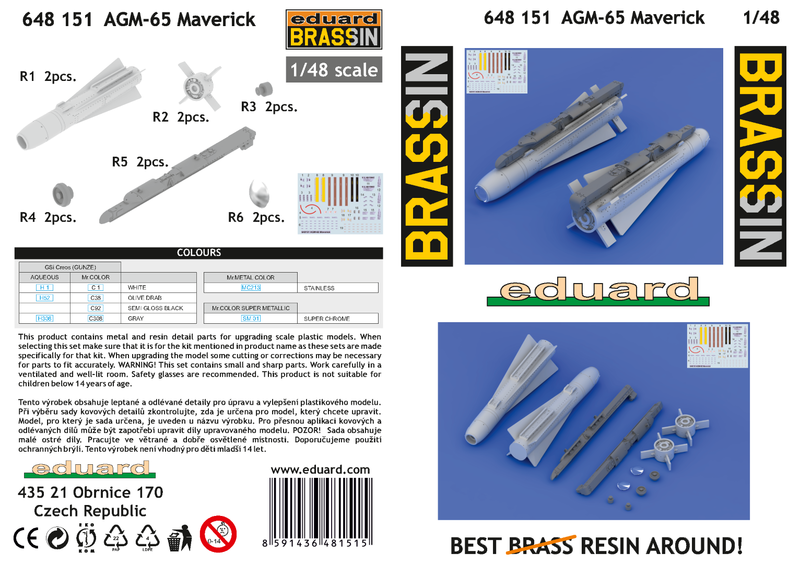 The Eduard Brassin set contains parts for two missiles and two LAU-117/A single-rail launchers in 1/48 scale, and come in the standard Brassin blister packaging. Eduard provides options to do either the AGM-65B, AGM-65E, AGM-65D or AGM-65H. 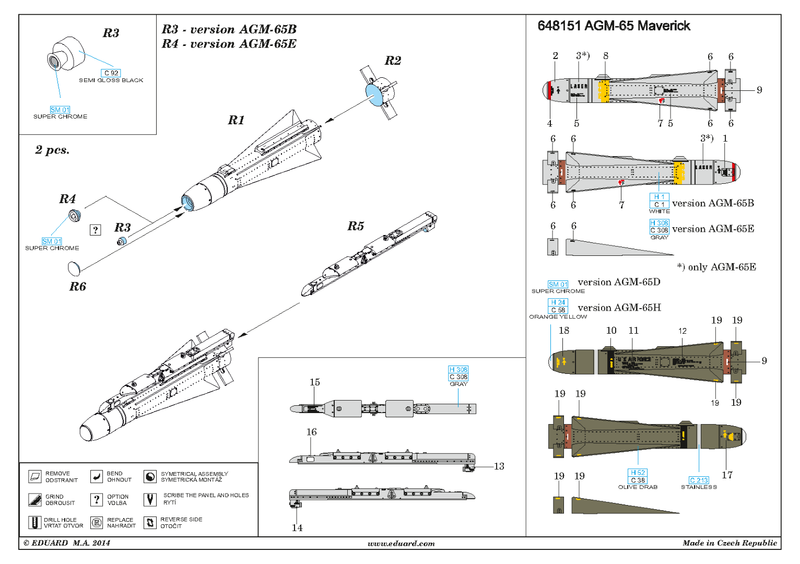 However the modeller can make any version as all Mavericks are the same size with variations in the seeker head and missile body colour; white, OD green or grey; so again, check your references. Each missile consists of two grey coloured resin parts; the main body and the rocket motor rear section; and a seeker head dome in clear resin. Two options are available for the EO seeker (TV or Laser). The LAU-117 single-rail launchers are casted as one piece. The resin parts come on the usual casting blocks which need to be removed. The fine detail of the AGM-65 missile and the LAU-117 rails is very nice and matches my references. The aft section rocket motor details really look the part. The wings are very fine and care is required when cutting off the casting blocks. View of Rocket Motor Section. Note the correct up orientation of rocket motor part (right) to align with launcher rail umbilical. Seeker heads, AGM-65B TV Seeker (Part R3 small part) and AGM-65E (Part R4 large part); and clear seeker head domes. All Mavericks have either a glass nose for electro-optical (EO) imaging versions or a zinc sulphide nose for imaging infrared (IIR) versions. The length, diameter and wingspan of the Eduard Brassin AGM-65 match official figures within the margin of error. The following are a couple of views of the LAU-117/A single-rail launcher. When first introduced, it was common to see the Maverick mounted on triple rail LAU-88/A launchers but most aircraft employ the LAU-117/A single-rail launcher since the late 1980s. The missile actually slides onto the launcher rail. Note this is the wrong way around, for demonstration purposes only. Also included is a small decal sheet with all the stencilling and colour bands required. The construction, painting and decaling are outlined in the instruction sheet. These new AGM-65 missiles from Eduard are definitely a step up in quality and detail to what has been available in the past. The size and shape appear to be accurate. I definitely will be getting a few more sets for the A-10’s, AV-8B’s and F/A-18’s in my stash. Highly recommended.